The end users of assets created using the Mindmatrix sales enablement software can now provide instant feedback to the marketing team through the asset rating system. Asset Rating Feature is a new addition to the Mindmatrix Platform! The asset rating feature is a testimony to Mindmatrix's commitment towards sales and marketing alignment. 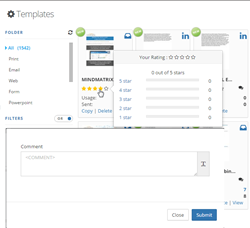 Mindmatrix users can now rate the sales and marketing assets created in the Mindmatrix platform. This new feature adds a new level of enablement and effectiveness in the asset creation feature. The Mindmatrix collateral module allows companies to build powerful sales and marketing collateral including landing pages, social media and email campaigns, sales presentations, etc., at the corporate level and then share them with their channel partners and salespeople. This new rating feature helps companies track the performance and effectiveness of their sales and marketing assets. After they use an asset, the salespeople and channel partners are prompted to rate the assets on a scale of 1 to 5, lowest to highest. This asset rating system is a new method to get immediate feedback about the asset from the user’s perspective. The development team at Mindmatrix believes this enhancement is the answer to questions like--Did the salespeople like the look and feel of the template? Was it easy to locate and customize? Did it really meet the needs of the prospect at a particular step in the sales cycle? Rating the assets is simple and only takes a click. This feature will help marketing teams get a clear idea of what the sales channels like and don’t like, which in turn helps corporate marketing departments design and deliver materials that are more effective and will actually be used.